Caitlin Marsh is our director of digital marketing and events, which means she's more likely to be found at a computer than a bookshelf on most days. She's the one behind our email newsletter, website content, and even some of our graphic design, so she stays pretty busy. She's also the selector for all of our Brilliant Books Monthly Audio subscribers. I took a roundabout way to working at a bookstore, though from the sound of things, the roundabout way is the most common route! I had actually planned to work in public health—specifically, at the CDC—but as I was wrapping up my master's degree, I realized that the frustration I felt with the pace of academia wasn't going to go away. So I took all the skills my degree had given me, and started looking for different ways to apply them. Maybe it's a surprising segue, but the ability to understand and talk to groups of people works as well in marketing as it does in healthcare, so after a few years of this and that, I found myself here at Brilliant Books! What's the quirkiest job you’ve ever had? Well, now that you know my degree's in public health, you'd expect me to have something pretty different, right? Well, I do, but it's not because of my background. I used to be a kids' party magician. Nothing terribly flashy, but I was pretty good at card tricks. My finest moment was making a chosen card appear in a classmate's wallet in college, though, to be perfectly honest, I'm still not sure how I pulled that one off. How about the five least interesting things about me? I know six digits of pi—seven, if you count the decimal point. I like to embroider by hand, but I lost count of the number of different stitches I know. I'm a mezzo soprano in most choirs (or an alto, if necessary). I bake all my own bread. And...um...I've never been on a roller coaster. There. That's five. 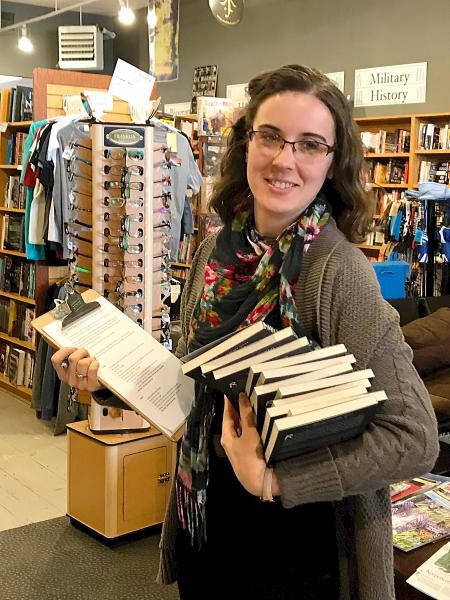 What’s one thing you wish more people knew about being a bookseller? It's really tough! I say this as not-quite-a-bookseller, so I feel like I can spill this insider information. Book people tend to be introverts, and it takes a lot of energy to be able to walk up to strangers all day and strike up conversations, especially when the other person in question is likely also an introverted book person. Of course, it's a bit easier when those conversations are about books, but it still takes some effort to get people out of their shells. I'm always in awe of how good at it my coworkers are! You’re browsing a bookstore. What’s the first section you gravitate toward? Sci-fi and fantasy! I've always loved these genres and the way that these imaginary worlds can hold a mirror up to our own in smart and subtle ways. That being said, I'm a sucker for fairy tale retellings, plagues (that's my public health background showing there), circus arts, overly complex heists, unreliable narrators, dry humor, and high fantasy featuring anthropomorphized animals—because why not? If someone asked for a book recommendation, but you can only ask one question to see what they like, what would you ask? I've only recently gotten the chance to do much book recommending, now that I've started choosing books for all our audio subscribers, but I think the best question to ask would be "Why do you love your favorite books?" I don't necessarily need to know what they are, but I definitely need to know what really struck home with the reader and why they hold onto these particular stories. Ideally, I'd ask more than one question, but if I really was limited to just the one, that would be it. Caitlin is also one of our Brilliant Books Monthly book selectors. Learn more about how she chooses audiobooks!